A strong finish to the first quarter and growing optimism about proposals by the Trump Administration to reform the U.S. tax system lifted sentiment among affluent investors in April to its most bullish level in years. The Spectrem Millionaire Investor Confidence Index (SMICI®) rose 10 points from the previous month to 20, while the Spectrem Affluent Investor Confidence Index (SAICI®) gained four points to 10. The 10-point rise in the SMICI is the largest month-to-month increase since January 2014, propelling the Index to its highest total in more than 3 ½ years. It is just the third time in the last decade that the SMICI has reached 20. Likewise, the SAICI reached its highest reading since July 2015, and is up 6 points from the same period last year. The monthly Spectrem Investor Confidence indices track changes in investment sentiment among the 16.3MM households in America with more than $500,000 of investable assets (SAICI), and those with $1MM or more (SMICI). This month’s survey was fielded between April 14-19, 2017. 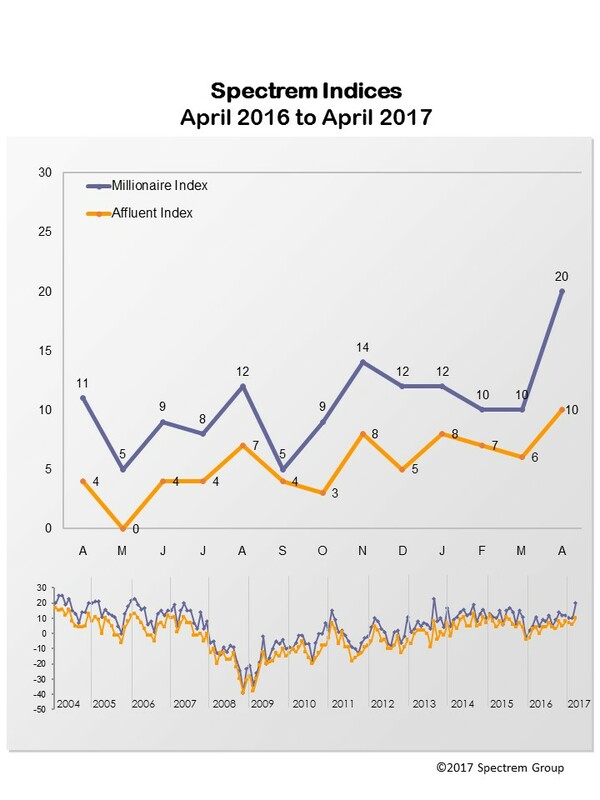 The dramatic increases in the April Affluent Investor Confidence indices were driven in large part by Millionaires expressing growing interest in reengaging with the market. When asked how they would invest in the coming month, roughly one-fourth of Millionaires said they would hold on the investment sidelines. This is a 20-month low. In addition, the percentage of Millionaires who said they would invest in Stock Mutual Funds in the coming month surged roughly 15 percentage points to 50 percent, a 39-month high. At 43 percent, intention to invest in Stocks was little changed from the previous month. Another driver of the Spectrem Investor Confidence indices is the Spectrem Millionaire Household Outlook, a monthly measure of confidence across four financial factors that impact an investor’s daily life, including Household Income, Household Assets, Company Health and the Economy, At 33.40, the April Millionaire Household Outlook is at its highest level since November 2014. Confidence in Household Assets is at a 33-month high and Household Income is at a 26-month high. Company Health and the Economy are flat in comparison to the previous month, but all four components are up from April 2016.